We love documenting weddings at Down Town Club in Philadelphia. It is probably one of our most loved wedding venues in the city. But as for wedding photographers, it might get challenging sometimes to photograph weddings at the same venues multiple times and to create something new and unique each time. For this reason we strive to always look for unusual angles and backgrounds, shooting through objects, reflections, double exposures etc. to produce a kind of photograph that will look different and will stand out from the rest of pictures previously captured at the same location. 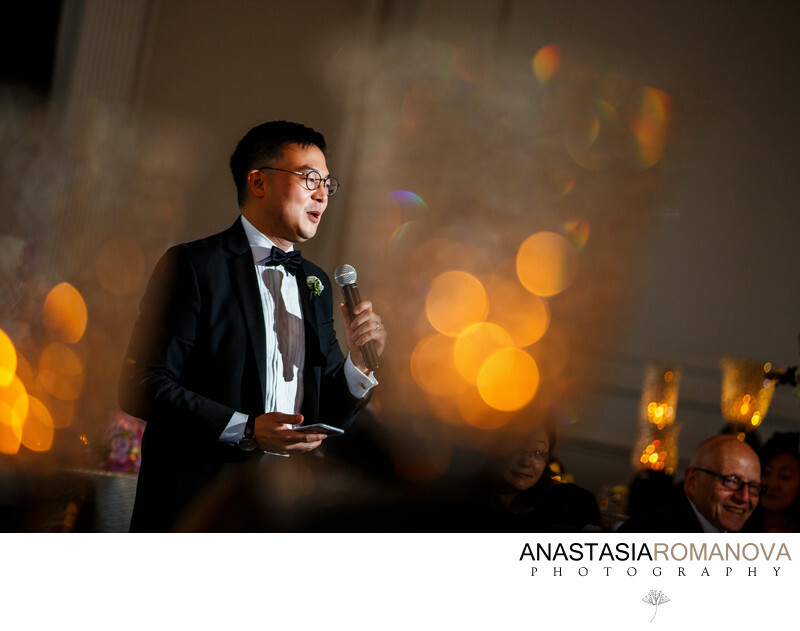 This best man's speech photo was taken during the reception held at Down Town Club. After taking a solid number of safe vertical and horizontal frames of the scene, we were looking for some interesting objects to add to the composition in order to make it a little bit more vibrant and unique. Walking discreetly around the guest tables, I spotted this gorgeous bokeh coming from the candle lit centerpieces. To archive this effect, the camera was placed couple feet from the candle vase, zoomed in and slightly angled in order to get more of the yellow candle bokeh in the frame. To lit the entire scene, there was one off camera flash firing to the camera right. ISO 640; 168mm; f/2.8; 1/125 sec.